Distinguished guests, including U.S. Vice President Joe Biden, gathered to speak at a mental health forum on the 50th anniversary of a landmark mental health act. 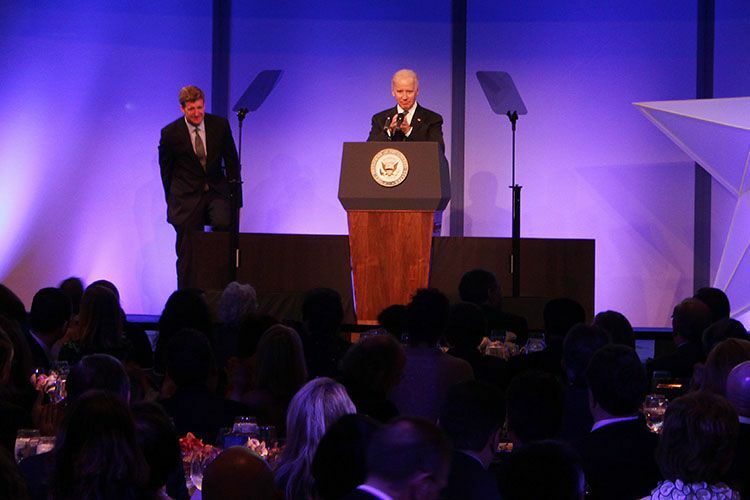 Biden said to a crowd of about 400 people at the John F. Kennedy Presidential Library and Museum that humanity is on the cusp of remarkable changes in the treatment and understanding of mental illness. “Imagine how fundamentally we can change society and communities for the better if we make significant strides in dealing with mental illness, [imagine] the impact on our global and national economies if we keep kids from dropping out of high school, if we keep employees from losing work … more classrooms where kids focus on school work instead of being overcome by anxiety,” he said. The two-day forum marks the 50th anniversary of U.S. President John F. Kennedy’s signing of the Community Mental Health Act that was signed before his assassination and transformed the way people with mental illness are treated in the country. Former U.S. Rep. Patrick Kennedy, U.S. Secretary of Health and Human Services Kathleen Sebelius and Chris Matthews of MSNBC also spoke at the forum about the steps they are taking to help those suffering of mental illnesses and how to educate those who are not familiar with them. Matthews, a longtime John Kennedy historian, said Patrick Kennedy continues his uncle’s work in improving mental health policy. Biden said improving mental health treatment will benefit not only families and their finances, but also the economic status of the nation. “As President Kennedy put it, mental illness affects more people, requires more prolonged treatment causing more suffrage by the families of the afflicted, wastes more of our resources and constitutes more of a financial drain on the public treasury and personal finances of individual families than any other single condition,” he said. Patrick Kennedy, a mental health advocate, said he and his peers have launched a bold attack on mental illness emphasizing treatment. The Affordable Care Act, which builds on the Mental Health Parity and Addiction Equity Act of 2008, opened for enrollment on Oct. 1 and requires coverage of mental health and substance-use disorder benefits of Americans in the individual markets that do not have them, extending federal parity protections to more than 62 million Americans. Sebelius said people must feel that they can seek treatment without being judged and that the Affordable Care Act is a step in the right direction. Biden said change can happen in terms of destigmitizing mental illness. I have been on 100% disability for 4 years with major depression. It is manageable with medication and continues to be chronic which makes it impossible for me to work. I was in healthcare, prior to going on disability, after losing 10 GOOD jobs in 11 years, due to repeated episodes of crippling depression. I have a master ‘s in counseling and bachelor ‘s degrees in psychology and occupational therapy. The stigma around around mental illness, in my experience, remains EXTREMELY persuasive, ESPECIALLY in the healthcare professions, not to mention most other career areas. Anyone not willing to acknowledge this, in MY opinion, has their head in the sand! !